PONTE VEDRA BEACH, Florida – Rory McIlroy is seven weeks away from his 30th birthday, and a decade removed from getting kicked out of bars in nearby Jacksonville Beach for underage drinking, a missed cut at THE PLAYERS Championship in 2009 leaving him with a free weekend. His once untamed hair has been replaced by a shorter, more professional look. But that’s just a visual difference of his maturity. Having entered what he describes as the “second phase of my career,” McIlroy has replaced peak-and-valley results with consistency and patience. He has replaced confidence – perhaps at times bordering on cockiness – with comfortability. Soon, he’ll celebrate his second wedding anniversary; no longer does he define himself by his golf results. He sees life through a different lens now. Ten years into a US PGA Tour career that will one day end up in the World Golf Hall of Fame, McIlroy also has experiences. Many on the positive side; some not so good. Call it scar tissue, call it seasoning – all of it paid off Sunday in the pressure cooker at TPC Sawgrass. 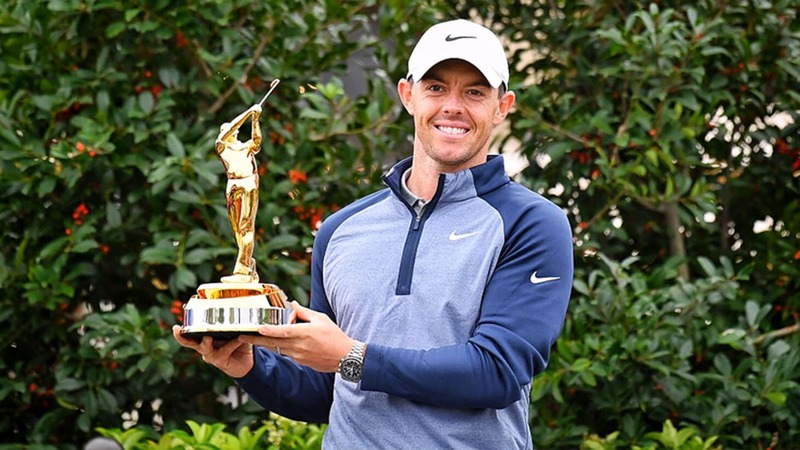 Shaking off an early double bogey, McIlroy worked his way back up the leaderboard, then delivered the key shots down the stretch to emerge with the new gold trophy as THE PLAYERS champion, beating 48-year-old Jim Furyk by a stroke. It ends a winless drought of just over a year since his last Tour victory Bay Hill. More important, it should end any chatter that McIlroy can’t deliver down the stretch. McIroy entered this past weekend with top-six finishes in each of his five previous starts. He had chances to win in Hawaii, in Mexico and last week, in his defence at Bay Hill, two hours down the road at Orlando. Some saw the results as a precursor to the inevitable. "At the start of the season when I was looking at his setup just on TV, he just looked a lot more relaxed," said Jason Day, paired with McIlroy on Sunday. "His demeanour was a lot different compared to last year, and winning again was just a matter of time, it was going to happen." Yet his failure to close – he also had not won a tournament worldwide in the last nine times he had played in the final group – had the buzzards circling. However, McIlroy entered Sunday drawing on the positives he had seen in that stretch. In his first 23 rounds of 2019, just one was over par. He was playing brilliantly – and he drew on those positive vibes in his final-round 70. But it wasn’t just the last two months that McIlroy leaned on to navigate a leaderboard in which a half-dozen players had a share of the lead at one point or another. As he saw the jumbled leaderboard, McIlroy thought back to his BMW Championship win in the 2012 FedExCup Playoffs at Crooked Stick (which, like TPC Sawgrass, is a Pete Dye course). At the par-5 16th, McIlroy two-putted from 19 feet for birdie to pass Furyk and take the solo lead at 16 under. As he walked toward the iconic 17th – perhaps the toughest Sunday walk in golf with a one-shot lead – he told himself that he needed just three more good swings. The first one came when he choked down on a 9-iron at the 17th, his tee shot landing safely on the green for a sigh-of-relief par. The second was off the tee at the par-4 18th – among the toughest tee shots in golf. The night before, McIlroy spent time on the range, hoping to straighten out a driver that had hit just four of 14 fairways in the third round. He doesn’t usually make those post-round range visits, but the driver is the most important weapon in McIlroy’s bag, and he could ill afford a repeat in the final round. And he also drew on another experience – this time at the 2008 Hong Kong Open, when Rory was a teenager playing on the European Tour. He had a chance to win, even though he was uncomfortable with the tee shot at 18 all week. That Sunday, he pulled the 3-wood, committed to the shot and piped the drive. Although he eventually lost a three-man playoff that day, that one tee shot 11 years ago paid off this time. “I don’t believe in anything really, but I think the golf gods will reward you for just making a good, committed swing,” McIlroy said. “And any time I have a tough tee shot, I stand up, I pick my target and I swing as hard as I can. And it usually works out because you’ve committed to it, you’ve got a clear head." Safely on the fairway, he now faced the last of his three swings. From 155 yards, his approach covered the flagstick – a courageous line, to say the least, given the front-left pin placement just steps from the water. When he reached his ball 13 feet away, he knew the tournament was his. The win is the 15th of his US PGA Tour career, and he now joins Tiger Woods as the only golfers to win a PLAYERS, the FedExCup, a World Golf Championships event and multiple majors. And his 15 wins before age 30 have been matched by just five other golfers – Woods, Mickelson, Jack Nicklaus, Johnny Miller and Tom Watson. Pretty heady company. But the celebration was muted as he rolled in his winning putt and headed to the scoring area. Sure, he was happy to win. His newfound perspective, though, has him keeping his emotions in check. He wants success in life, not just inside the ropes. Maybe it was just meant to be, a Northern Irishman winning on St. Patrick’s Day. Asked if he had ever previously won on this holiday, McIlroy mentioned last year at Bay Hill, when the third round was on St. Patrick’s Day, a two-day celebration. Then he pulled up the sweater he was wearing to reveal a green shirt. “It’s not a bad weekend for me,” he said, his Irish eyes doing all the smiling.